You need to send us payment of the whole of the price for the package you have ordered before we can accept the transaction. Once payment has been received, you will get a confirmation that your purchase has been accepted by sending an email to you at the email address you provided when you made the order. This will create a legally binding contract between us, that will ensure you receive your tampons pack for the period you requested. When you make an order, you will automatically be signed up to receive a regular delivery of tampons for the date specified in your selection. You can manage and make changes to your orders at any time by logging into your account. 2.1 The price of products is as quoted on the website and can change from time to time. Prices stated include VAT and delivery charges. 2.2 Boxes can only be delivered to addresses within the United Kingdom (including Northern Ireland); this excludes PO Box addresses and BFPO addresses. 3.1 You may cancel your contract at any time but you need to do it at least within 5 working days of your next due payment. You do not have to provide explanations, neither will we ask you to pay any penalty. 4.1 We reserve the right to cancel the contract between us if: we have insufficient stock to deliver the tampons you ordered, we cannot deliver at your address (you live outside the UK), one or more of the package you ordered was listed at an incorrect price due to an error with our suppliers. 4.2 If we do cancel your contract, you will receive a notification by email and will receive the sum you paid from your credit card within 30 days after you made the purchase made on the website. We will not pay any other compensation than the amount of your order. 5.1 You will receive your package at the address given on the website when you made your order. If that address changes after you made your purchase, please notify us via email so that we can make the needed adjustments. 5.2 Delivery will be done right after you made your order, as soon as possible but not longer than 30 days after your purchase. 5.3 Once you receive your tampons, we will not be responsible for their loss or destruction. 6.2 If you do not receive your order within 30 days after your made the purchase on our website, we shall not be responsible unless you notify us in writing at our contact address of the problem within 40 days of the date on which you made your order. 6.3 If you notify an issue with your order under clauses 6.1 or 6.2 listed above, our only obligation will be, to provide you with your order, to replace or repair any goods damaged or defective; or to refund to you the amount paid by you for your order. 6.4 As stated in the law, we will not be liable for any indirect or consequential loss, damage or expenses under this condition and we shall not refund you your order under those circumstances. 6.5 You must comply with all applicable regulations and legislation, including necessary customs, import or other permits to purchase from our site. Unless specified otherwise on the face of the order, the prices are inclusive of, and we shall be solely responsible for and pay, all national and local taxes, including, but not limited to, value added tax, goods and services tax, sales, use or consumption tax. The importation or exportation of certain goods may be prohibited by national laws. We make no representation and accept no liability in respect of the export or import of the goods you purchase. 6.7 In addition, we make no representation that the operation of our site will be uninterrupted or error-free, and we will not be liable for the consequences of any interruptions or errors. We may change, restrict access to, suspend or discontinue the site or any part of it at any time. The information, content and services on the site are provided on an «as is» basis. When you use the site and or participate herein, you understand and agree that you participate at your own risk. All notices from you to us must be in writing and sent to our contact address and all notices from us to you will be displayed on our website. In the case where any part of these terms and conditions is unenforceable (including liability exclusion) the enforceability of any other part of these conditions will not be affected. Except for our affiliates, employees or representative, a person who is not a party to this agreement has no right to enforce any term of this agreement (except when stated otherwise in any applicable law.) Nothing in these Terms and Conditions confers on any third party any benefits under the provisions of the Contracts (Rights of Third Parties) Act 1999. No statement (even from our employees) should be understood as a variation of these terms and conditions. We shall have no liability for any fraud or fraudulent misrepresentation, our information being untrue or misleading to our customers. Due to the nature of the products, we rarely accept returns. 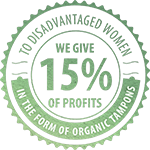 If you are dissatisfied with any product you receive from us, please contact our customer services at: customerfirst@organictampons.co.uk.